Garlic butter is really easy to make and is a great condiment to have on standby in the fridge for when your meal needs that extra flavour kick. It can lift the flavour of meat, fish and vegetables and is of course the perfect accompaniment to a warm baguette. The butter will keep happily for a week in the fridge and up to a month in the freezer. 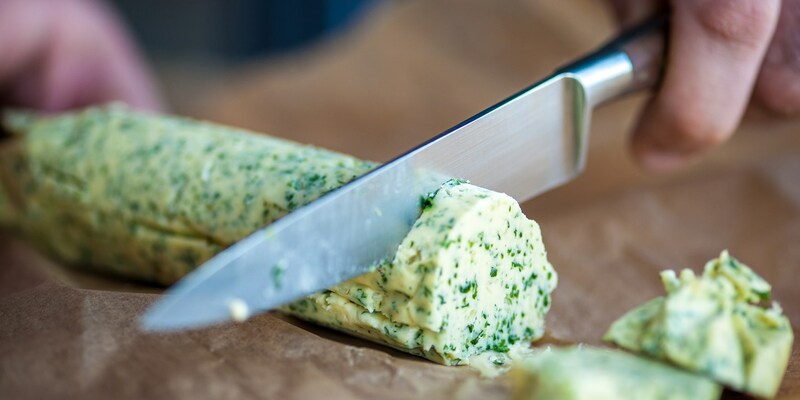 Try adding chopped herbs to the butter for extra flavour, thyme, tarragon and parsley all work particularly well. You could also try adding a bit of a kick from a pinch of chilli or some cracked black pepper. Henry Harris' Poached duck egg is served with leeks vinaigrette, deep fried snails and bacon and garlic butter. Lisa Allen makes and irresistible Tear and share garlic bread and Paul Ainsworth makes tempting Garlic dough balls wrapped in prosciutto. Vivek Singh smothers his Naan bread in garlic butter and you could try folding a spoonful through a creamy risotto.